A recent statement by Pope Benedict XVI in which he declared the Roman Catholic Church to be the only "complete" Christian faith met with angry responses from the heads of several western, Protestant denominations. In Egypt, meanwhile, Benedict's assertion about Eastern Orthodox churches -- that they "lacked something" in their capacities as churches -- prompted no less of an angry reaction from the Orthodox Coptic Christian community. "It's the Vatican's right as a religious institution to establish its own internal doctrines particular to itself," Youssef Sidhoum, editor-in-chief of independent Coptic weekly al-Watani told IPS. "But it doesn't have the right to issue statements passing judgment on other churches." On Jul. 10, in an official document approved by the Pope, the Vatican declared that the Catholic Church was the only church to contain "all the elements that Christ himself instituted." The proclamation went on to assert that Protestant Christian denominations were not "churches" in the full sense of the word, while non-Catholic orthodox churches suffered from certain imperfections. According to the document Protestant denominations, which split from Rome in the 16th century, should be viewed as Christian "communities". As for churches of the Eastern Orthodox rite, the papal statement conceded that they do constitute proper churches, having been established on the basis of apostolic succession (meaning they were founded and maintained by Christ's original apostles and their successors). Nevertheless, the statement went on to note that these churches "lack something" for not recognising the primacy of the Pope. Despite these assertions, the document went on to stress the Vatican's continued commitment to ecumenical dialogue with leaders of other Christian denominations. Salib Meta, member of Egypt's Coptic Christian Religious Council, riposted by saying that it was the Eastern Orthodox rite that represented Christ's original church. "The Catholic Church is the one that...deviated from the true faith, which is represented by the Orthodox Church," he stated in a Jul. 11 interview on Arabic-language internet news service Alarabiya.net. The Coptic Church, members of which represent an estimated 10 percent of Egypt's 75 million-strong population, split with the Catholic Church in the fifth century over differing views on the nature of Christ. In an effort to soothe outraged Coptic sentiment, the Egyptian Catholic Council issued a statement Jul. 11 explaining that the Vatican's assertion had only "pertained to the rites of the western church." The statement went on to stress the Catholic Church's "respect and appreciation" for all Christian churches outside the Catholic fold. But the clarification was not enough to placate discernible displeasure on the part of the Coptic leadership. In a Jul. 14 interview, head of the Coptic Church Pope Shenouda III criticised his Catholic counterpart, saying that Pope Benedict appeared to be "making enemies all the time." 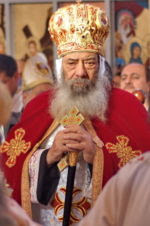 Speaking to flagship government daily al-Ahram, Shenouda said that Benedict, in only two years as Pope, had already managed "to alienate all the Muslims." The reference was to Benedict's declaration in August of last year, in which he stated that Islam was "a religion of violence, spread by the sword." Shenouda went on to say that the Catholic Pope, in his latest assertions about fellow Christian churches, "has now also alienated many of the Christian denominations." Assistant Catholic Patriarch in Egypt Father Boutros Fahim declined to comment on Shenouda's remarks. "It's better not to reply," he was quoted as saying in the Jul. 15 edition of independent daily al-Masry al-Youm. "To quarrel is not among the traits of the Catholic Church, which has already issued a statement reiterating its respect for all Christian churches." But despite the uproar over the latest Vatican statement, the assertions made therein are hardly new to the Catholic Church. A declaration issued in 2000 by the Vatican's Congregation for the Doctrine of the Faith -- headed at the time by the current Pope -- actually made many of the same claims. "What was said in the document was not new to Benedict," acknowledged Shenouda, "but rather a repetition of an earlier document called 'Dominus Iesus', issued in 2000." According to Sidhoum, however, the recent declaration was not itself as important as the person who made it. "When those earlier statements were made in 2000, they didn't lead to a media uproar or have a negative effect on the relationships between churches," he said. "That was because John Paul II was still pope." "But while John Paul II spread a message of peace and understanding, Benedict has issued a document promoting conflict and intolerance between churches," Sidhoum added. "The document essentially represents a relapse in terms of Catholic thinking." Only four days after the controversial Vatican statement, Egypt's Coptic Church held a reception in Cairo under the provocative slogan "The Coptic Orthodox Church is the only Christian Church". The event was organised to commemorate the reactivation of the church's official relations with the Ethiopian Orthodox Church, frozen since 1994. Sidhoum, however, criticised the church's choice of words, which he viewed as another unnecessary provocation. "None of the churches -- even the orthodox ones -- have the right to call themselves the only 'true' Christian Church," he said. "Such statements can only lead to intolerance between Christians and between various Christian denominations."